Size of Male: 25-27 lbs., 18 in. Size of Female: 25-27 lbs., 18 in. The Irish Terrier is known as a “daredevil” and these dogs can have a devil-may-care reckless energy about them. However, they are good-tempered and very affectionate. They are absolutely loyal to their people. They are very gentle toward their family but otherwise rugged dogs. They love children and they can make an excellent family pet. The Irish Terrier is believed to be one of the oldest of the terrier breeds. The breed’s exact origin isn’t known but they are believed to be descended from the black and tan terrier dogs of Britain and Ireland. They were valued for their working abilities by all classes in Ireland and used for killing vermin. They also make a fine watchdog. At one time they came in all colors and types. They began to be shown at dog shows in 1875. 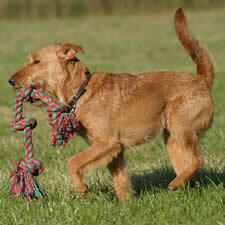 Also known as the Irish Red Terrier, this is a very lively breed and they are generally good with people. They love children and they are able to put up with a great deal of rough play. However, this dog breed is very energetic and they are not always easy to train. They are not as eager to please people as some other breeds, which is a trait that is sometimes found with terriers. Irish Red Terriers may also have problems with dog-dog aggression, especially male-male or female-female issues. These dogs require good socialization from a young age and they need to learn that they are not in charge in the home. They do need early dog training, especially when it comes to getting along well with other dogs and other pets in the home. Living Environment – Irish Terriers can make good apartment dogs. They are somewhat active indoors but they can relax and rest if they get enough daily exercise. They are equally at home living in the country. These dogs will chase small animals if given the chance, so it’s best not to allow them to exercise off-leash or out of a fenced yard unless they have permission to catch and kill what they find. Grooming – Their harsh, wiry coat is fairly easy to care for. The wiry coat doesn’t shed but, for a pet, it will need to be stripped out a couple of times each year to remove the dead hair. This can be done by a good professional groomer. The coat should not be clipped, which would ruin the texture. The wiry coat protects the dog’s skin and repels dirt. You should use a shampoo that is specifically made for wire coats. These dogs don’t need to be bathed very often. Diet & Exercise – Dietary needs are normal. These dogs do require plenty of daily exercise. They will enjoy having their own yard if possible but they can be prone to digging, like many terriers. Health – The Irish Terrier is considered a generally healthy breed. However, they can have occasional problems with canine hip dysplasia. Hyperkeratosis can also occur in the breed. Canine hypothyroidism and cataracts are also possible problems. If you are interested in this breed, you should talk to a breeder about possible dog health problems. Terriers, in general, are often considered harder to train than other dogs. They can be independent and have less desire to please their owners than some other breeds. For these reasons, dog training is not always easy for Irish Terriers. However, this is a very intelligent breed and they can be trained if you find ways to motivate them. Many Irish Red Terriers respond equally well to food and other forms of motivation, such as play and affection. They have succeeded in obedience, agility, tracking and other dog activities. They have even been used as hunting dogs. Train this dog breed with positive dog training methods (praise, rewards) and you should be able to succeed.